You know you’re getting your Halloween baking right when you’re constantly asked if you watch Dexter. 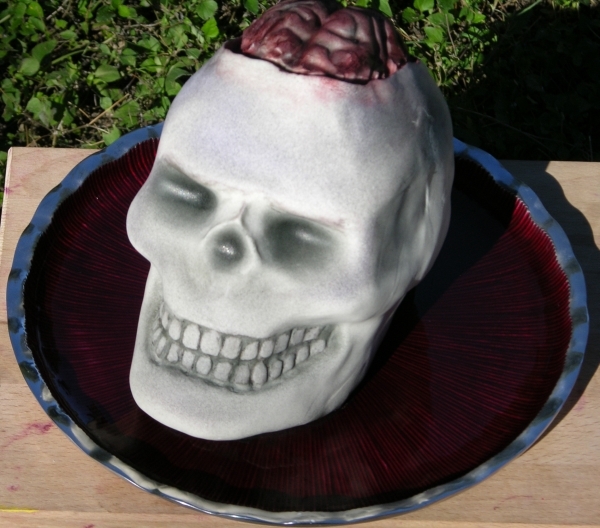 I wanted to make a bleeding brain skull cake for the Halloween party thrown my by husband’s employer last year, especially since I spent the money on the big Wilton 3D skull pan the year before and really should cost-justify it more often. 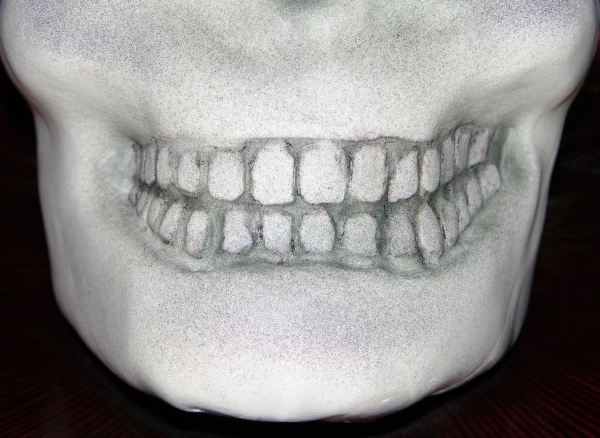 That’s right: buy the skull stuff at Halloween, find reasons to use them forever. That’s sound craftnerd investment, that is. 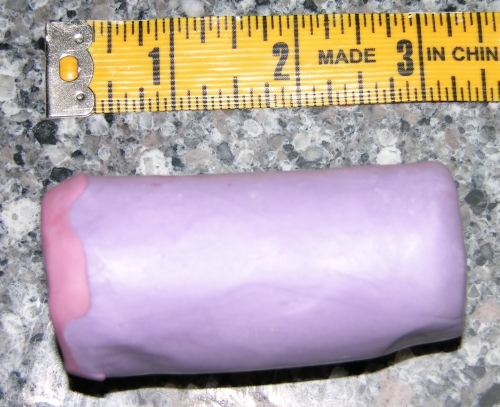 I wondered if I could do the brain as a long blood-filled tube all curled up on itself so it would bleed at any point when cut. I know just enough about fluid dynamics to realize that if you’ve got a tube filled with liquid and bend it, that increases the pressure, so that I’d need a way for excess to escape during bending. 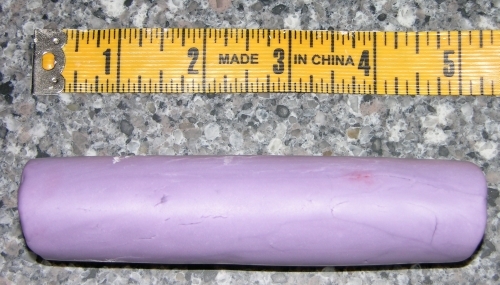 But my more immediate concern was to wonder if the caning nature of modelling chocolate would lend itself to making a long, stretched tube filled with goo in the first place. 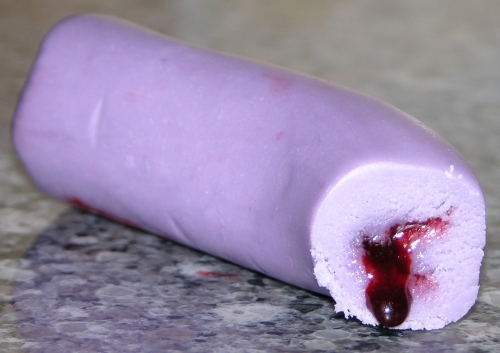 I put some of my tasty fake blood in a modelling chocolate capsule like I did with the Bleeding Zombie Rat Cake. I then started gently rolling it to stretch it, and at first it was working. This is just getting started, not much longer than the original tube. But in short order, it all went badly. The modelling chocolate started to crack under the changing pressure of the internal fluid (so fondant wouldn’t have done much better) and let the blood seep out. So clearly the pressure was a problem. I made a new tube and this time let cracks appear as I rolled, but kept them under control. I let the pressure readjust, then capped the leaks with more modelling chocolate. This got the roll a lot longer, so there was faint – if sticky – hope. You can see the various plugs and patches, plus smears from the leaks as I rolled. This is certainly not pretty on the outside. Meh. One drop after waiting too long. Not very bleedy at all. Well that was disappointing, especially since the actual application would have to be even longer with probably even less reaction. I mashed it all up together and tried one more time, going even more carefully. By this point the modelling chocolate had taken in a lot of extra corn syrup via the fake blood, so not only has its colour changed, but it was also getting really soft and sticky. 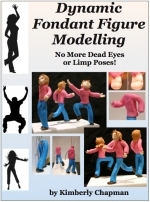 This is as pliable as modelling chocolate gets. That time I managed to keep the blood mostly inside, so I figured I should try bending it and see if – as expected – the internal fluid pressure would wreck the whole thing. Yep. 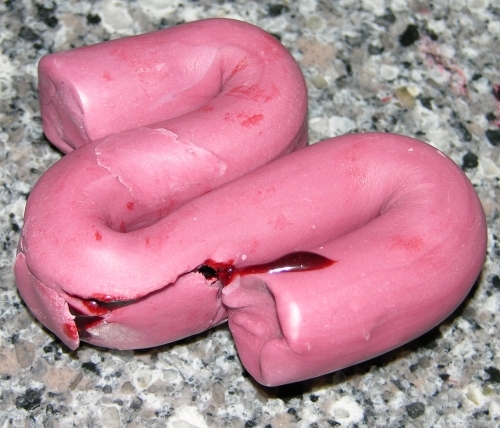 As mentioned above, this modelling chocolate was soft and pliable at this point, yet it still cracked under the increased pressure of bending the fluid. That bit to the right actually spurted out of the middle as I bent it. Wait: does this make me a blood bender like in those Avatar cartoons? Sweet! Literally! More meh. There just isn’t enough blood in there to make this worthwhile. 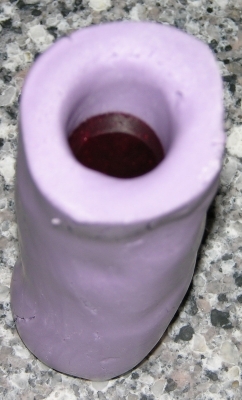 The best possible piece and even here there’s insufficient blood in the tube to make for a good bleeding when cut. Meh meh meh. I gave up and instead went for one of my brain molds, picking the size that was closest to the skull pan, or at least where the texture would allow me to fake it best. Yes, of course I have multiple brain molds in multiple sizes. 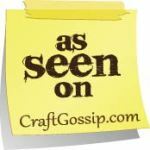 Haven’t you been reading this blog long enough to guess that? Anyway, I dusted the mold with corn starch and put in a sheet of modelling chocolate at about a quarter inch thick. 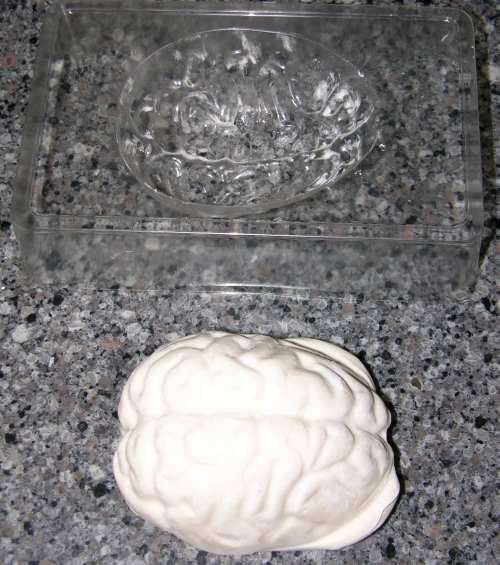 This is actually a jelly mold kit and although the brain was not the right size, it was a good start since it gave me the right sort of texture that I could then gently stretch out a bit. I made the skull cake, cut a bit off the top for where I wanted the exposed brain to be, and covered it with white modelling chocolate. 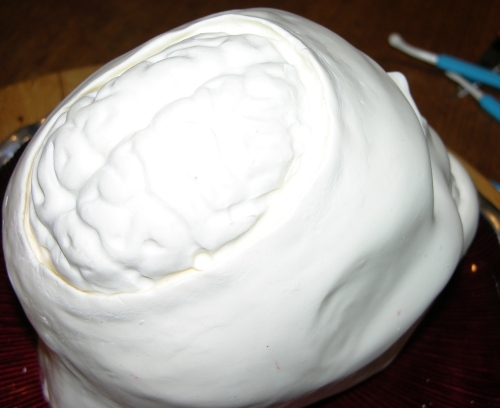 I made a flattened area for the molded brain to sit upon, including a bony ridge around the edge, and mounted the brain so it made a hollow cave against the flattened area. I sealed it down thoroughly on all sides but the very front. 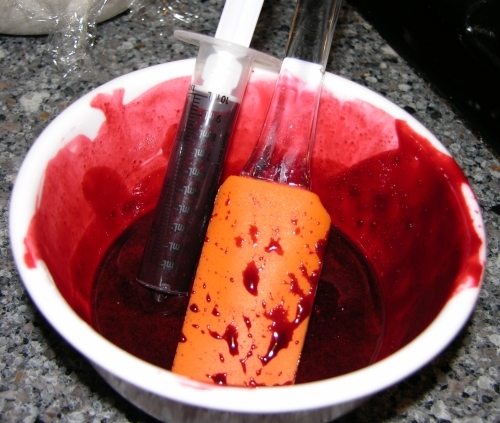 Then I filled a medicine syringe (the kind for giving babies medicine, but this one was fresh and never used with actual medicine) with more of my fake blood mix. These medicine syringes work well with corn-syrup based recipes like the fake blood on account of being made to dispense corn-syrup stuffed kiddie medicines. Ew. 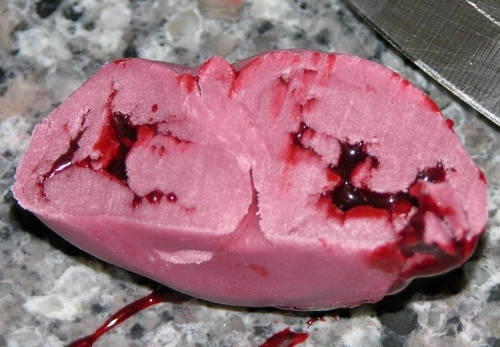 Next I simply squirted the blood into the brain area until it was almost full, then sealed it up. Peek a boo, I bleed you! 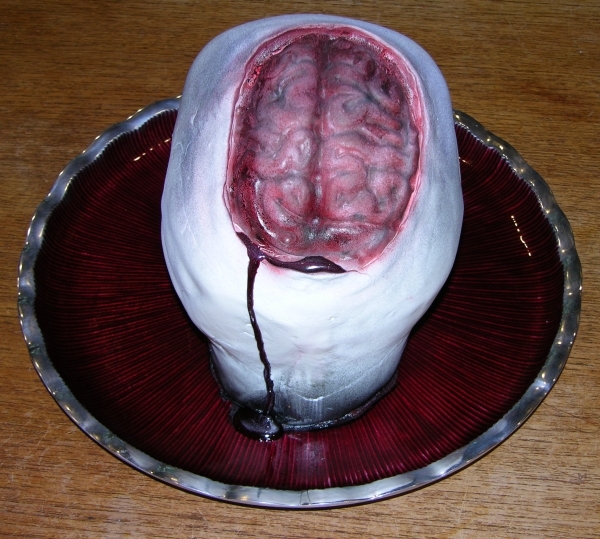 Sealed up brain cake. No hint yet that there’s a giant puddle of fake choco-blood in there. Muahahahaha. Then I went about airbrushing black into the recessed areas of the skull until I noticed the blood started to leak out the back. I was pretty happy with how these looked. The airbrushing makes a huge difference compared to just having the white modelling chocolate. 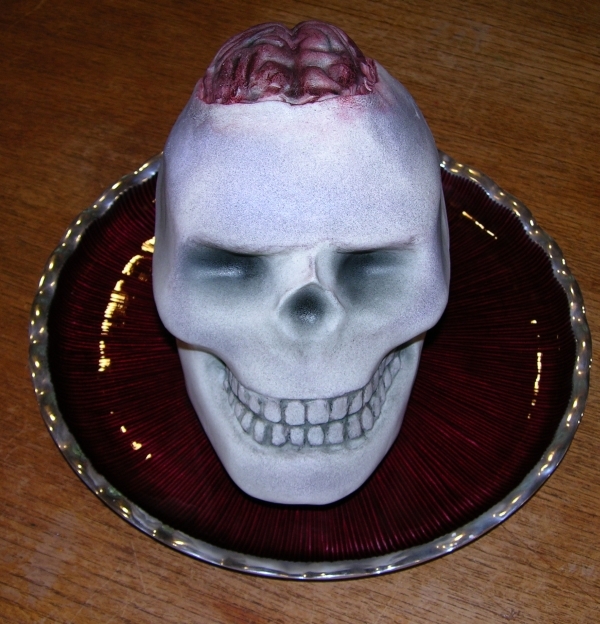 I airbrushed the brain a mix of black and red to make it nice and gory, and had the whole cake on a cool red glass platter the kind folks at the Forth Worth ICES gave me for doing a gummy demo at their Day of Sharing a couple of years ago. I think it’s supposed to be a nice, fancy platter and not be used as decorative gore, but hey, that’s how I roll. 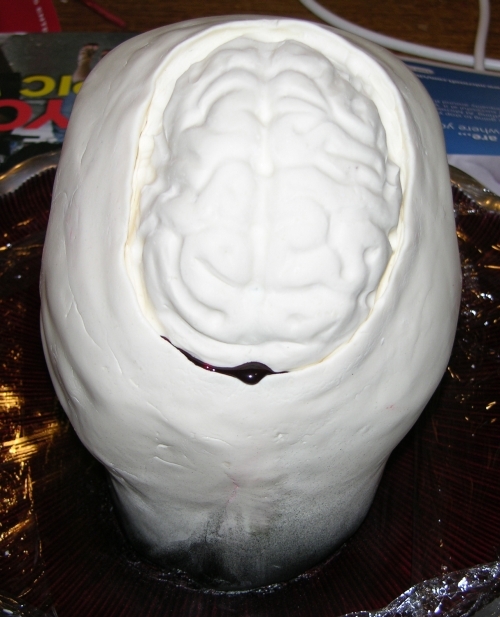 The completed skull brain cake. He’s smiling at you. Muahahahaha. I took him to the backyard for a nice holiday and some sunny pictures. He seems pretty happy about that. Then again, with teeth like that, what does unhappy look like? Right: Skeletor. Got it. Note: did you know Skeletor can’t use a straw? Muahahahahaha. Unfortunately, the leak didn’t stop. In fact, it got worse. Bad enough that I decided it was now a “feature”. Yes. I meant to have it leaky all along. Yes. 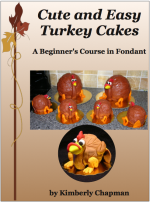 Do you really want to quibble with someone serving a cake like this? I didn’t think so. 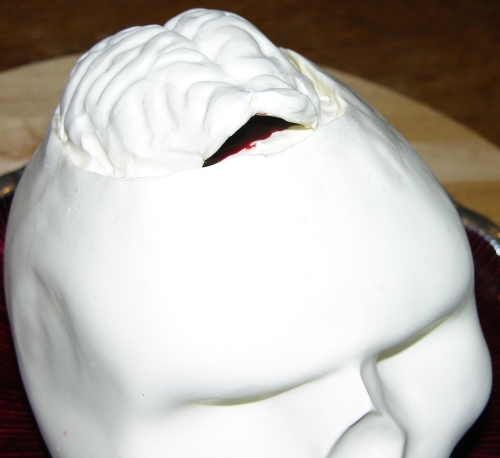 Thankfully even though it slowly seeped on the dessert table at the party all evening, there was still enough blood in the brain that when I cut it, it flowed all over in a nice disgusting manner, as you can tell from the squeals of delight all around as I cut into the thing. Muahahahaha. So even with the errors and failed experiments, this was definitely a success. I’d say if anyone else is going to give it a go, just be sure to super-duper seal that brain at the back end before filling it with blood. 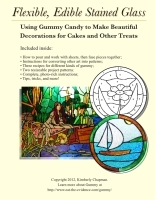 This entry was posted in Cake Decorating, Experimental Techniques, Fancy cakes, General Freakishness, My Recipes, Sick and Twisted. Bookmark the permalink. 3 Responses to If You Prick Our Brains, Do They Not Bleed? Brilliant. I really need to work more with modeling chocolate. An idea. Though I know you said the brain mold wasn't big enough and you stretched the shell after removing it from the mold. 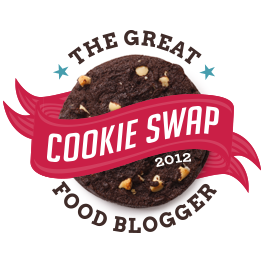 What about filling it while it's still in the mold, and then covering it and sealing it, like you would do a pie crust? An interesting idea, although I'm pretty sure moving it at that point would risk leakage, just because of the cracky nature of modeling chocolate.